NFL commissioner Roger Goodell responds to ESPN's damning "Outside the Lines" Spygate report with obfuscation. NFL Commissioner Roger Goodell looking chastened, responding to his mishandling of the Ray Rice domestic abuse case in 2014. 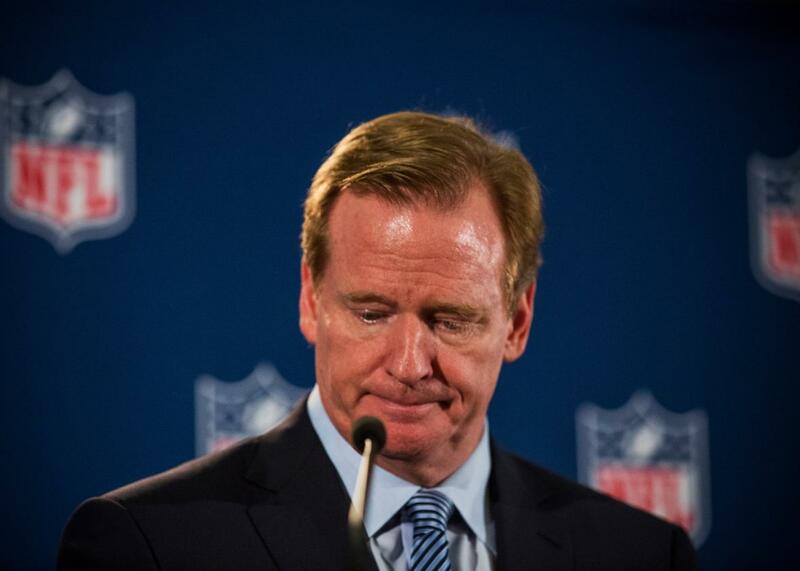 Roger Goodell should probably not say any more things about spygate or deflategate until he gets his story straight. The NFL commissioner was asked about a blockbuster ESPN report on his mishandling of the twin New England Patriots cheating scandals on Tuesday morning, and he denied one of the report’s key findings. That denial, however, is contradicted by the league’s own statements. In an interview with ESPN’s Mike & Mike shortly after the report broke, though, Goodell was asked how the league’s actions in the 2007 scandal impacted its actions in this one, and he denied that it did. Former Sen. Arlen Specter, who investigated the NFL’s process at the time and publically called the NFL’s investigation “fatally flawed,” had jotted the words “cover-up” in his handwritten notes, OTL reveals. According to OTL, when Deflategate broke, owners wanted strong action against the Patriots this time around. After years of mishandling other disciplinary matters—such as the Ray Rice domestic abuse case—Goodell obliged and he was able to shore up his position by doing so. That Goodell would deny that this history was even a factor in the latest case—when Vincent’s statement to the contrary was cited just last week in a ruling by Judge Richard Berman, who overturned Tom Brady’s four-game suspension—shows that he’s more interested in obfuscating on the subject than in even feigning to offer a reasonable explanation. It’s well past time for him to leave his position, but if Goodell insists on staying then the least he could do is make sure his excuses make sense. *Correction, Sept. 8, 2015: This post originally misstated Troy Vincent’s title as NFL executive president.